I recently read "Alias Grace" by Margaret Atwood (it's on Netflix, too, but I am more of a book nerd than a show watcher so I have yet to view it), which dramatizes the life of a convicted murderess in the mid nineteenth century. During her meetings with a researcher, she is often quilting and shares her thoughts. The copy of the book I read featured simple drawings of quilt blocks to accompany each chapter, so I snapped pics of some of my faves, one of which I settled upon for this quilt; in the book it was referred to as "Fox & Geese" but I've also seen this block called "Old Maid's Puzzle". 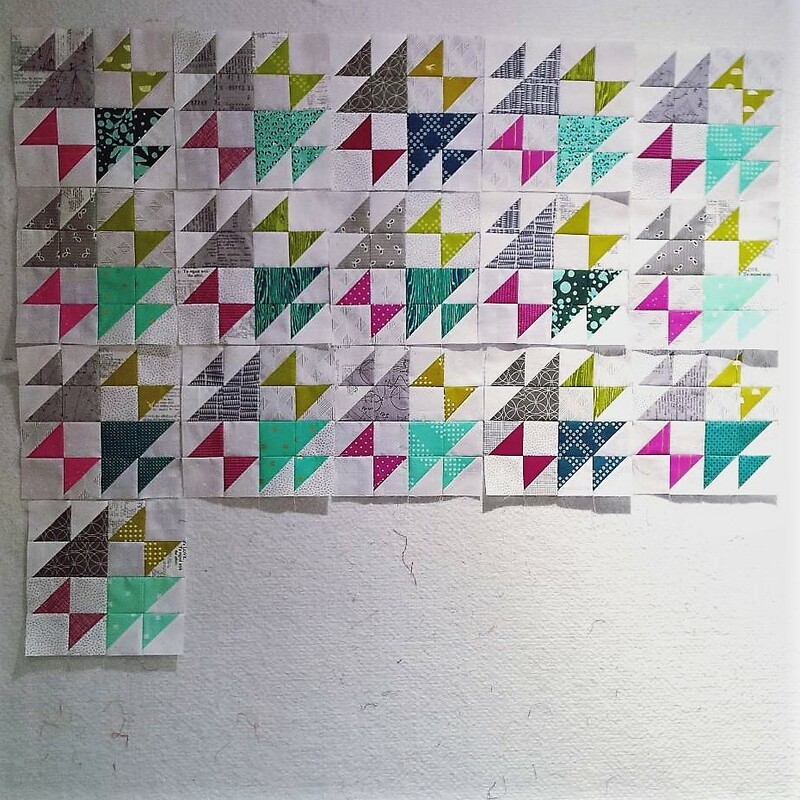 Decision made on design, I merrily set to cutting fabrics and piecing blocks and was really loving the individual blocks. As they started to form a little community on my design wall, I was less in love; does this ever happen to you? Then the conversation with myself began: "Do you still love the colors you chose? ", "Yes, Self, I most certainly do. ", "Do you still enjoy the individual blocks you made? ", "Yes, Self, they are fabulous. ", "So, the problem is the layout... Let's play with that. ", "Self, that's a great idea!". Part-way through the process of assembling blocks and grouping them on the design wall. Feeling pretty "Meh" about them at this point. After a little rearranging and rotating some of the blocks, I became MUCH happier with this layout. I dig the star-shaped secondary pattern emerging and I feel this layout has more movement. Here's the finished product entitled "Rainy Day". 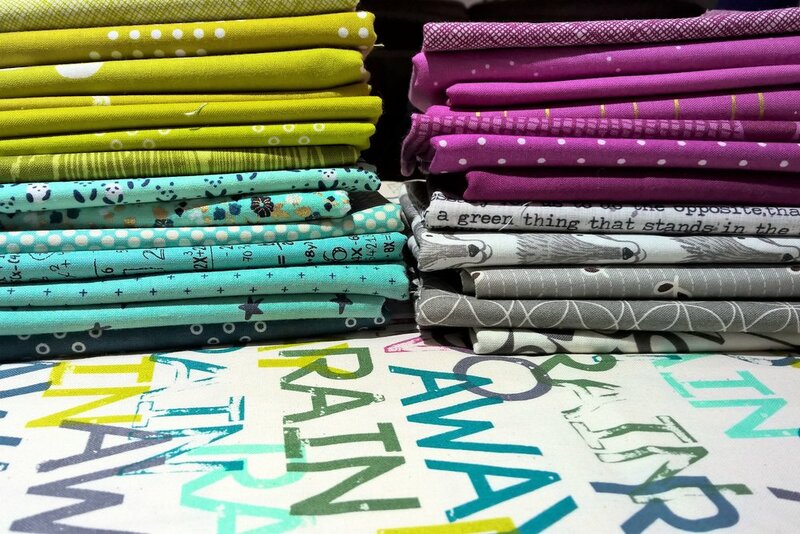 I used lots of Cotton + Steel basics (I can't get enough of them, it's a problem), but you'll also find some Denyse Schmidt, Carolyn Friedlander, Art Gallery, and Tula Pink in the mix. I used an assortment of low volume fabrics for the background (a continuing theme in most of my work) in shades of whites and pale grays. Here's "Rainy Day" on a sunny day! Ha! 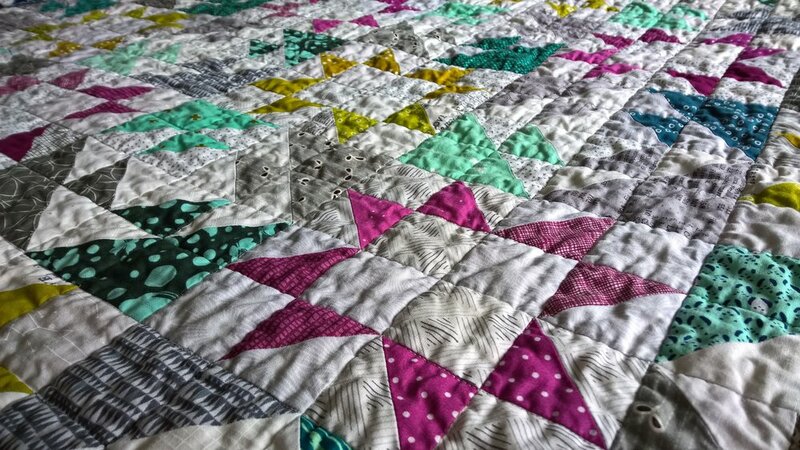 Up close and personal with the quilting! I stitched in the ditch in a 2-inch grid. The texture and drape is divine! Hand-stitched binding in a Cotton + Steel basic: Dottie's cousin in teal. I fully enjoyed the process for this quilt and adore the finished product! I've listed this quilt in my shop and I hope it will bless a sweet baby and family soon! Checking off the last item on my Finish-A-Long list!